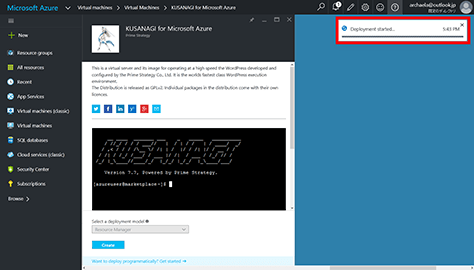 KUSANAGI for Microsoft Azure is a free virtual machine image built to execute WordPress at high speeds on Microsoft Azure. 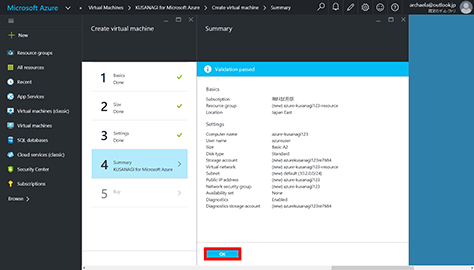 * This guide assumes you have an account with Microsoft Azure and are able to access the Azure Portal. 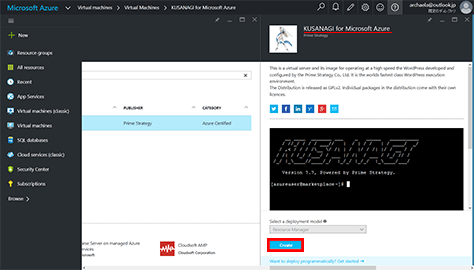 The VM image for KUSANAGI for Microsoft Azure is available in the Marketplace. 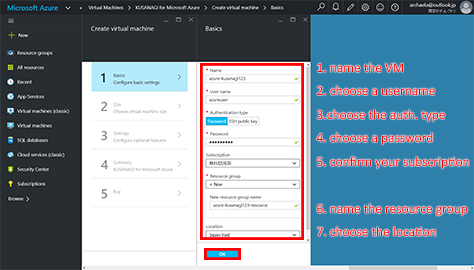 First select the image and follow the instructions to deploy the virtual machine. 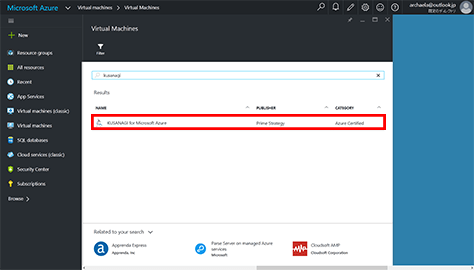 From the Azure Portal screen, you can browse virtual machines in the Marketplace. Click “Virtual machines” on the left menu. The “Virtual machines” screen will display, so click “Add”. 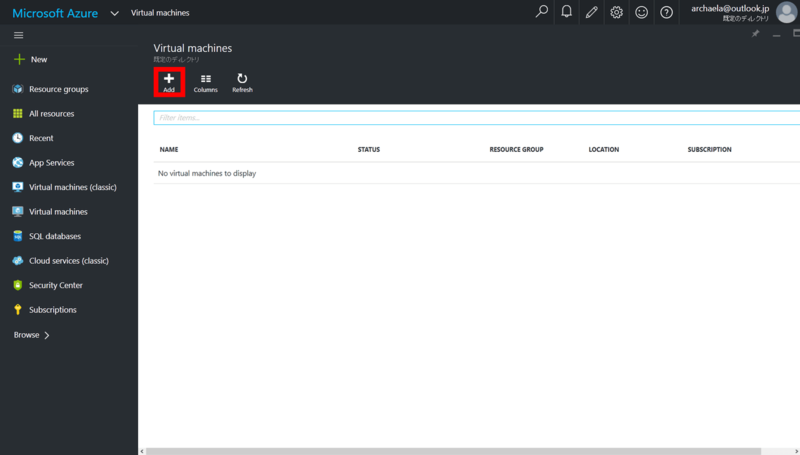 You will now be looking at the “Virtual Machines” search screen. You can search for the term “kusanagi” on the “Virtual Machines” search screen. In the search field, type “kusanagi” and hit Enter. 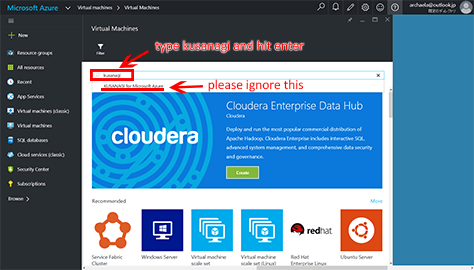 * While entering your search term, “KUSANAGI for Microsoft Azure” will be suggested but please ignore this. 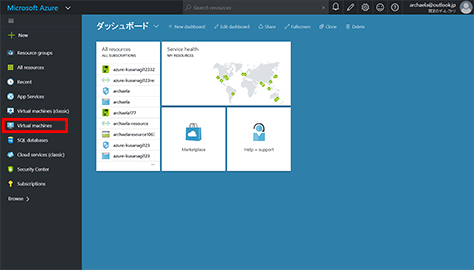 After searching, select the VM image KUSANAGI for Microsoft Azure. On the right side of the screen, click “Create”. 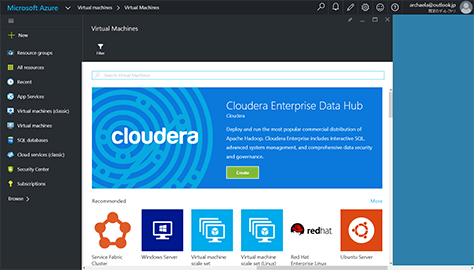 Create and launch a virtual machine from the selected VM image and log in. The “Basics” screen will display. Fill out the form and click “OK”. * Please make a note of the user name and password you choose since these will be used to log in. The “Size” screen will display. 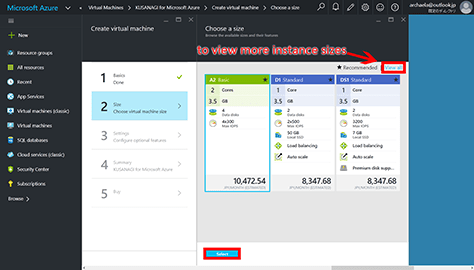 Choose the instance for your virtual machine. 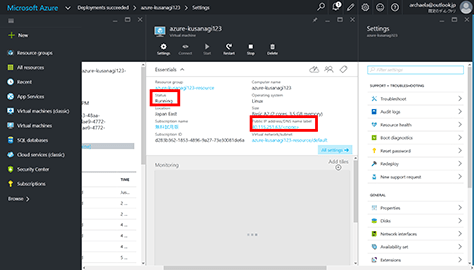 The requirements for KUSANAGI for Microsoft Azure are an A2 Basic instance or above and a minimum of 3.5GB of memory. The “Settings” screen will display. 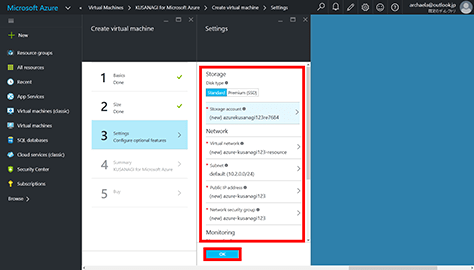 You can select the settings for Storage, Network, Monitoring, and Availability. If you are unsure, leave the defaults. You may make changes at a later time. You may also configure the ingoing/outgoing protocols and ports (or firewall) in Network Security Group. The default ports are 80 for HTTP, 22 for SSH, and 443 for HTTPS. We recommend that you make suitable changes for a more secure configuration, such as IP restrictions, depending on your circumstances. The “Summary” screen will display. After reviewing the configuration settings for your virtual machine, click “OK”. The “Buy” screen will display. 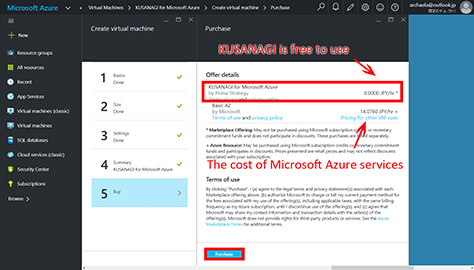 Since KUSANAGI for Microsoft Azure is free, it will show as 0.0000 JPY/hr. 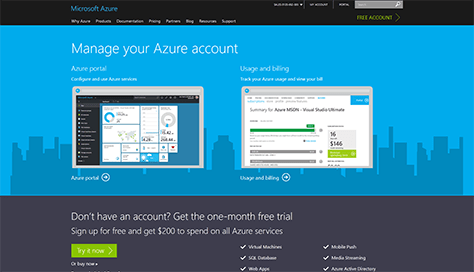 According to the terms of your Azure account, the “Buy” screen may look different. Even in this case, KUSANAGI is free. If this alternate screen appears, please click “Create”. 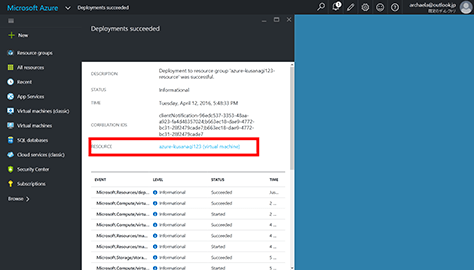 You will get a notification that the virtual machine is being deployed. Please wait. You will get a notification that the deployment succeeded. Click on this notification. Click on your virtual machine. Check that the status says “Running” and make note of the public IP address. Along with your username and password, this IP address is needed to log in. 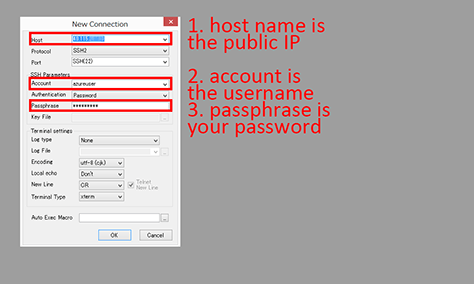 The host name is your public IP address, and you will also need your username and password. Once you are logged in, you will see this screen. Enter the following to switch to the root user. You will be asked for a password. Please enter the same password you used to log in. Check that you are the root user. If the command prompt ends in # you have successfully switched to the root user. and setting up a high speed WordPress server in this seminar. Please join to us if you interested to KUSANAGI and more details are waiting for you. Click on 7/16 Hands on application page. Click on 7/17 Hands on application page.